Home › Meta › Down Under Feminists Carnival is up at Penguin Unearthed! Down Under Feminists Carnival is up at Penguin Unearthed! Penguin Unearthed has the Sixth Down Under Carnival of the Feminists up. The carnival opens with a collection of posts about its focus, feminism and the workplace, then moves on to feminist mothering, sexual harassment, art, elections, reproductive justice, body politics, censorship, and more. She’s done a marvellous job, and there is plenty to read – go and check it out. November submissions for the Seventh Carnival at Ideologically Impure are now open. Submit your post (or a great one you’ve read) at Blogcarnival. It would be great to see some newer bloggers, younger bloggers, bloggers who haven’t been in the carnival before. Put your slips into the electronic suggestion box now. 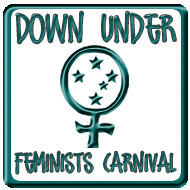 For more carnival information, see the Down Under Feminists Carnival homepage at Hoyden About Town. Drop me a line if I can do anything to help, Qot! I think I’ll be fine, it’s just the pressure to match up to all these fabulous carnivals past!